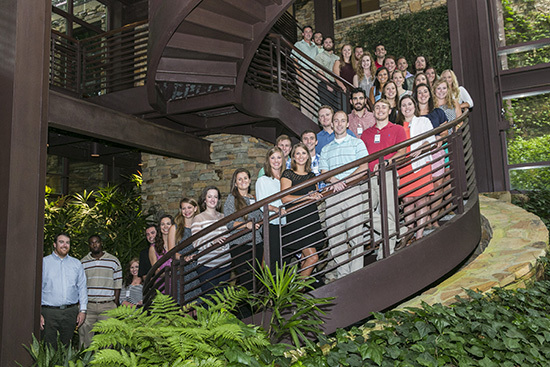 On Monday, June 1, 2015, Samford University’s School of Health Professions welcomed its first class of 35 students in the Doctor of Physical Therapy program. Students hold bachelor’s degrees from a number of universities across the Southeast. “This is an extraordinary moment for the College of Health Sciences and Samford University,” said Nena F. Sanders, vice provost of Samford’s College of Health Sciences. “We have a long history of health care education at Samford. To welcome a full class of physical therapy students, in our first year offering the program, tells us that we are continuing to meet needs in the market. We are looking forward to this outstanding group of students” she added. According to Matthew P. Ford, associate professor and chair of the Department of Physical Therapy, the three-year DPT program utilizes a rigorous curriculum built on foundational sciences—anatomy, physiology, neuroscience and exercise science, with four key components focusing on evidenced based decision making, wellness, service and technology. Students will complete clinical experiences in facilities throughout the United States. Interprofessional practice is also a key aspect of the program. “Health care is increasingly delivered by teams of professionals from different disciplines working in collaboration,” said Ford. “As a part of the College of Health Sciences, our students will graduate with experience working alongside individuals from nursing, pharmacy, nutrition, and more, uniquely preparing them to seamlessly transition into their professional roles,” he added. Physical therapy is one of several new programs being added in the College of Health Sciences, which launched in 2013. The college includes the School of Health Professions, as well as schools of nursing, pharmacy and public health. Admission to the doctor of physical therapy program is competitive. Applications for the summer 2016 class will be accepted beginning July 1 with a deadline of Oct. 1. In addition, Samford’s program will participate in the PTCAS Early Admission program; the deadline for admission to that program is August 15. For more information, please visit www.samford.edu/physicaltherapy. Effective April 29, 2015 Samford University has been granted Candidate for Accreditation status by the Commission on Accreditation in Physical Therapy Education (1111 North Fairfax Street, Alexandria, VA 22314; phone: 703:706-3245; email: accreditation@apta.org ). Candidate for Accreditation is a pre-accreditation status of affiliation with the Commission on Accreditation in Physical Therapy Education that indicates the program is progressing toward accreditation and may matriculate students in technical/professional courses. Candidate for Accreditation is not an accreditation status nor does it assure eventual accreditation.